In "Dairy-Free Ice Cream" you will find all of your favorite ice cream flavors free of dairy, gluten, grains, soy, and refined sugar. 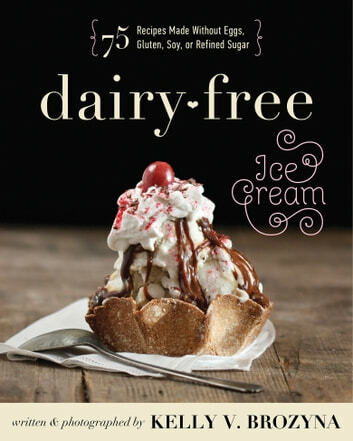 Chapters include Cool Tips for Perfect Ice Cream, A History of Dairy-Free Ice Cream, The Classics, Coffee & Tea Ice Cream, Yogurt Pops & Sorbet, Ice Cream Cakes & Sandwiches, and Toppings.For both health and personal reasons, eliminating dairy has improved the lives of so many people. With "Dairy-Free Ice Cream" you can not only enjoy every flavor of ice cream again, but avoid refined sugars, harmful oils, soy, preservatives, and other common ingredients found in store-bought dairy-free ice cream. Making your own dairy-free ice cream is affordable, healthy, and fun for the whole family. Delight guests at your next birthday party with ice cream sandwiches or build-your-own sundaes!